Want to replace your home’s normal windows for impact windows? If you have damaged normal windows and wants to replace with impact windows, be sure it is a smart and reasonable move. The decision will undoubtedly raise your overall construction costs, though – primarily when you are set to hire a professional impact window installer. Impact window is incredibly useful in hurricane-prone areas. Among their multiple benefits is their ability to crack in extreme pressure, but not to shutter and thus prevent debris from flying right into the house. And owing to their usefulness, many homeowners have adopted to install them in their homes, replacing the standard glass windows. First, a really dependable hurricane window that includes the frame and the impact window retails at between $20 and $55 per square foot. On average, an impact-resistant window or door measures 60” by 80” and may cost something like $500 for the window and $1,900 for the door. Factoring in the total number of windows you will need, you’ll find that the costs can be a few thousand dollars more. Impact resistant glass is classified according to the method of laminate procedure or the window interlayer procedure used in their construction. PVB and Polyvinyl Butyral made are the two most popular types, and both are excellent in protecting a house from the damaging effects of a ferocious tropical storm. But unlike Polyvinyl Butyral, PVB impact glass have a layer of PET – a reliably tough product, and this justifies the reason for their expensive nature. Away from these two, Sentry Glass Plus tends to cost more as it is more durable, sturdy and reliable. It is normally preferred for use in federal construction or specialized areas where bullets and bombs are a norm. There’s a less popular choice of impact glass made from resin poured between two glass slabs. 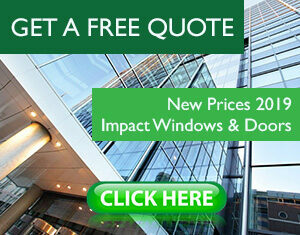 Please take a look at our IMPACT WINDOWS CATALOG. Replace the normal windows with impact windows is expensive. You may need permits or variances from the local authorities. Seek to know if the local authority has rebates. You can add $100 or $200 more to the cost of buying the glass – labor charges. Some professionals will charge more for replacements on delicate or hard-to-reach spots. The process can take a few hours to the whole day – it depends. DIY is highly discouraged owing to how risky the whole installation process is, especially for someone who doesn’t have the right tools. Should You replace the normal glass window with hurricane window on your own? This choice can be a bit tempting, especially when you get a sizeable quote from a window company and your budget can’t allow. Also, sometimes you see a contractor installing the window in your neighbor’s house, and you note how straightforward the procedure is. But if you are handy with the tools and the confidence in you is brimming, why not? If you need to change your normal windows definitely you have to contact a licensed installer in Miami. At Impact Window Center we can change your windows and doors with no problem. Please contact us or call us (+1 305 431.5533) to get your FREE QUOTE. This entry was posted in Impact Windows & Doors Tips and tagged impact glass windows, impact hurricane windows, impact windows, miami florida, replace windows. Bookmark the permalink. ← Why do you need storm door to protect your home?